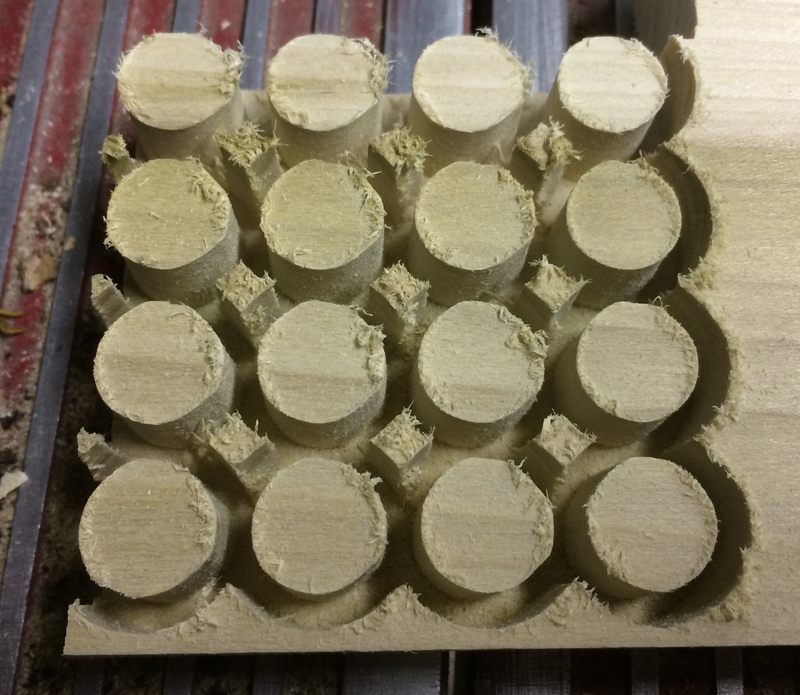 One of my favorite aspects of Inventables’s X-Carve CNC router is Easel, their free online carving software. My favorite part of Easel is that it is programmable — you can write apps for it. 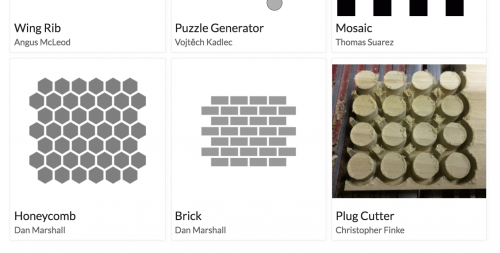 Apps automate tasks like turning an image into a puzzle, carving gears, or making inlays. 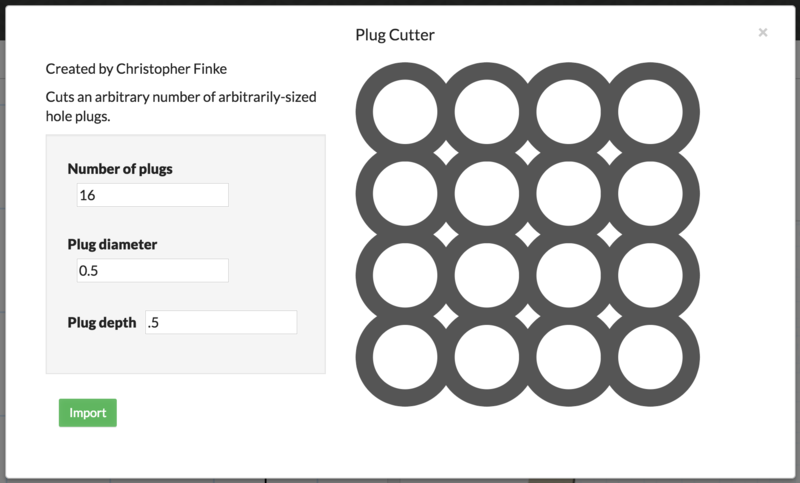 Inventables has written nine apps and published another 14 from independent developers, and today, they’ve published my first app, Plug Cutter. 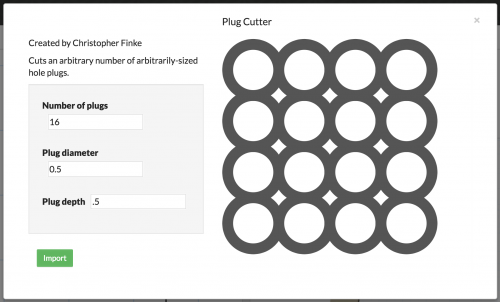 The Plug Cutter app turns your X-Carve into a plug cutter that can cut plugs in any size. The only constraint is your imagination (and the size of your X-Carve) (and the known diameter of the universe)! Choose your plug quantity, diameter, and depth, and the app will organize them on your workpiece to minimize waste. 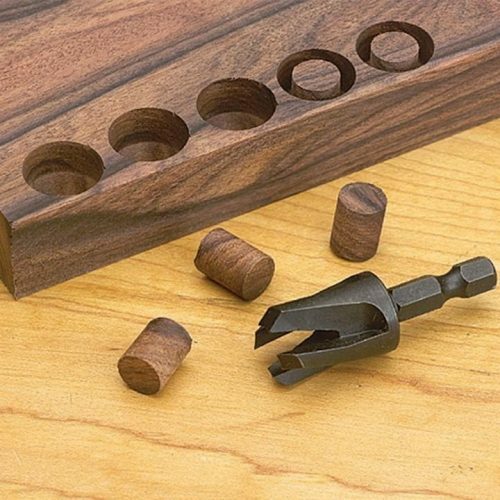 If you try it out, post a shot of your plugs in the comments! I had to spend a bit of time getting this just right in order to allow ScribeFire to upload media to Posterous, so I’m posting below the final solution at which I arrived; it was cobbled together from a dozen different examples I found around the Web (none of them solving the full problem), then lovingly massaged into the elegant function you see before you. With this function, you can pass in an array of fields and files, and the request will be crafted and returned to you, ready for upload. 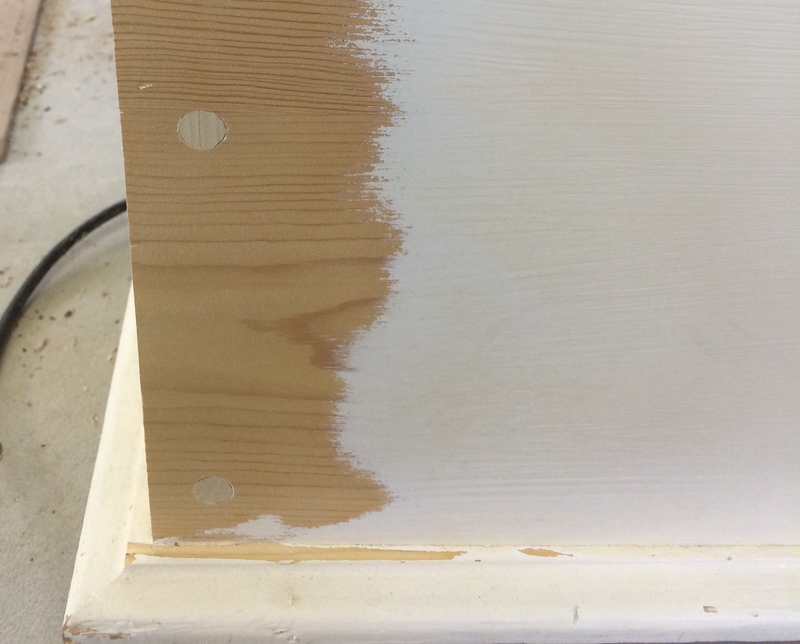 Instructions for use are in the comment block at the top of the function. * Generates a POST request body for uploading. * args is an associative array of the form fields. * theFile is an nsILocalFile; the headers param for the file field is optional. I am aware that the Facebook Image-to-Email Firefox extension is (once again) broken, and given that version 1.1 installed on Firefox 2.0.0.8 was working, and now version 1.1 installed on Firefox 2.0.0.8 is not working, it has to be due to a change that Facebook made. The problem is that I can’t discern any relevant changes in Facebook’s profile pages that would cause a problem. Any insight into this is appreciated. Of course, this appears to be pretty simple. Ironically, the hardest part of solving this problem was the only part that Gervase remarked would be trivial: matching the image against a set of known character patterns. Since the font is not monospaced, and certain letters bleed into each other when adjacent (such as “89” and “ef”), it wasn’t possible to just store the pixel values for each full letter. What I ended up doing was only matching against only the center of the letters (which are never affected by adjacent letters) and just ignoring character edges. One other detail as to the implementation: there appears to be some sort of security restriction in Firefox on reading data from images that are not in the same domain as the script reading them. For example, trying to call getImageData() from the chrome on a canvas that contained an image loaded from facebook.com returned null every time; the same happened if the script was running locally but loading a remote image. For this reason, the actual scripting that converts the image to text has to be injected into each page that requires it so that it appears to be running in the same domain as the image. I’m not claiming that this is the most efficient implementation, but it is definitely complete. In my testing so far, it has correctly identified 100% of the e-mail addresses displayed in the images.